Your wedding day is the most perfect day when two become one, so what better way to signify this than with the unique, cleverly designed Love wedding invitation? 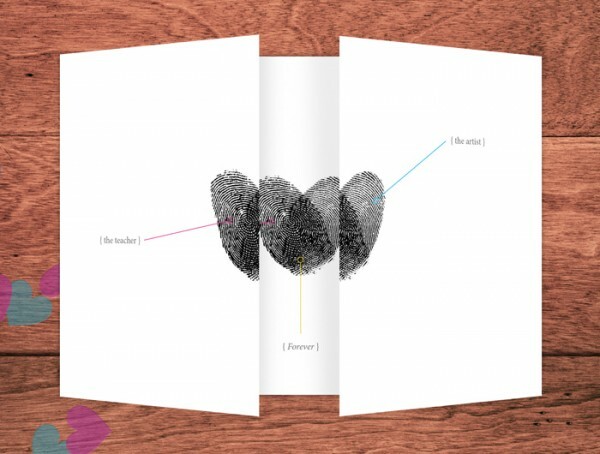 Perfect for creative types or loved up twosomes, this design features your very own finger prints! Just place your fingers on the provided ink pad that’s sent to you, pop them back in the post and we’ll work our magic! Each invitation will be professionally printed, complete with your fingerprints, so you can be sure that the finished effect will be absolutely perfect! The best bit is that your fingerprints will be arranged so that they overlap to form a heart shape – perfectly demonstrating the notion that ‘two become one’. So romantic! Your occupations will be added onto the front of your invitations so that all of your guests know which finger print belongs to who. Open the invitation and your fingerprints will be labelled with your actual names to clear up any confusion if you’ve just changed jobs or if Uncle Bob can’t for the life of him remember who the zoo keeper of the family is! As an extra sweet, tear jerking touch, the fingerprints on the inside of this invitation are also labelled with the word ‘Forever’. Upon first inspection these lovely invitations appear perfectly square, however, upon opening they will double in size, revealing your anticipated wedding day details printed in a crisp modern font. You can be sure that your wedding guests will never have seen such a quirky and creative wedding invitation before! Order from The White Attic Design. Tags: Finger Prints, Quirky, Unique.